Bangkok, Thailand is famous for delicious food and boat noodles (guay teow reua) are hugely popular. Migration Mark along with the other crowds flock to boat noodle restaurants near Victory Monument to devour precious bowls of steaming noodles. There's not much more comforting than a plate of Thai style Hainanese Chicken Rice in Thailand known as Khao Man Gai (ข้าวมันไก่ also spelled Kao Man Gai or Khao Mun Gai). Today I hit the streets of Bangkok's bustling Pratunam district to go to a restaurant that's serves Thai Hainanese Chicken Rice so fast, they don't even have time to hang the chickens like normal restaurant that serve Khao Man Gai (ข้าวมันไก่) do! Hainanese Chicken Rice ข้าวมันไก่ is a simple dish. The chicken is boiled in water, chopped up into bite sized pieces and served over a plate of rice that has been cooked with the chicken broth and fat to make it extra fragrant and flavorful. Khao Man Gai (Hainanese Chicken Rice ข้าวมันไก่) is served along with a bowl of chicken soup and a sauce that can be the real make or break factor of the dish. The sauce should be sour, spicy, and maybe a little sweet to go well over the chicken rice. Now I'm not saying that Khao Man Gai (ข้าวมันไก่) is a bad Thai dish, I'm just saying that's it's not the most flavorful Bangkok street food dish out there - but it's very comforting and soothing on the stomach. During this video I went to a restaurant known as Kaiton Pratunam (Ko-Ang) ไก่ตอนประตูนำ้ (โกอ่าง) in the busy central shopping district of Bangkok, Thailand known as Pratunam. This Thai restaurant no only specializes in Hainanese Chicken Rice (ข้าวมันไก่), but also in Khao Moo Op (ข้าวหมูอบ) which is rice with baked pork and delicious chicken soup (น้ำซุบ). ปากซอยเพชรบุรี 30 ประตูน้ำ ถ.เพชรบุรี มักกะสัน ราชเทวี กทม. เปิด 5.30 - 15.30 น. และ 17.00 - 3.00 น. So though it's not one of the best Thai dishes, Hainanese Chicken Rice in Thailand is a plainer dish that will surely be comforting and easy on the stomach. 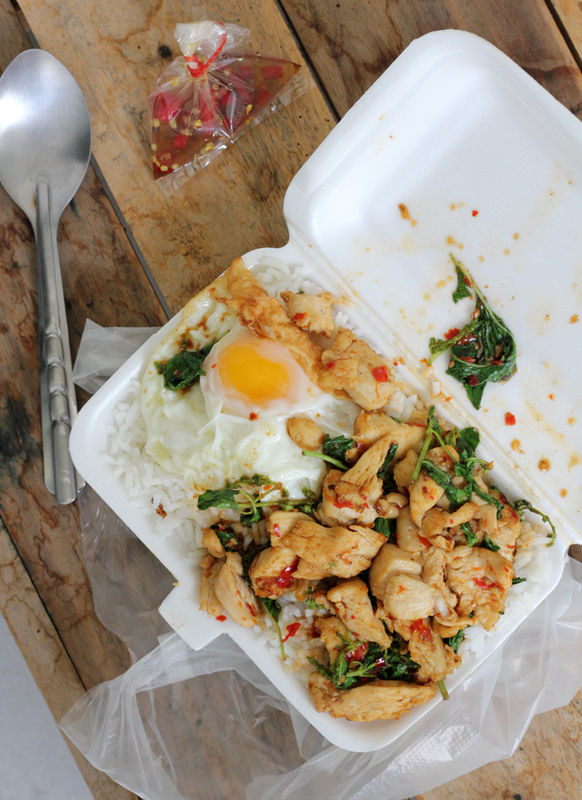 Grab a plate of Khao Man Gai (ข้าวมันไก่)! Mango sticky rice (khao neow mamuang ข้าวเหนียวมะม่วง) is one of the most popular and best tasting Thai desserts. In the summer when mango season comes to full blossom, the street of Thailand become alive with the delightful combination of sweet sticky rice and mango. The rice is precisely cooked with coconut milk and sugar to become sweet. It's expertly made so that each grain of rice has its own personality and texture. Only the finest, ripest and flawless mangoes are used for this Thai dessert. The fruit has to be extremely sweet, bursting with tropical flavor and also have a beautiful yellow orange color. The two main ingredients are combined on a plate before being doused in a generous helping out thick coconut cream syrup. The flavor of the coconut really combines the dish into one of the most sought after Thai desserts in the world. If you're a sweet tooth, you don't want to miss eating sticky rice and mango when in Thailand! BANGKOK STREET FOOD "The city never stops eating"
First episode of mini travel series about street vendors in Bangkok especially for foreigners. This episode will bring you variety of popular Thai appetaiser selling on street which are easy to find and to eat. Second episode of mini travel series about street vendors in Bangkok especially for foreigners. This episode will bring you variety of famous Thai dishes selling on street which make your tummy full of "Yummies". The last episode of mini travel series about street vendors in Bangkok especially for foreigners. This episode will get you to know more variety of traditional Thai desserts and drinks selling on street (but some of them are not really quite 100% Thai) which will make you sugar increased! Thai cuisine includes some of the most diverse culinary flavors in the world - each meal must contain a wide variety of dishes that incorporate all the taste buds. Thai food not only includes tastes like spicy and sour and sweet but also combines a mixture of stir fried, steamed, boiled, deep fried and lots of soups. Thai tom yum goong (ต้มยำกุ้ง) is one of the most popular and widely available soups in Thai cuisine. It's a soup that's spiced with chilies, flavored with shrimp or another meat, and made sour with lime juice. Each bite of Thai tom yum is like a burst of invigorating flavor. In this HD video recipe today, we'll be going over the ingredients and I'll show you exactly how to make some of the best Thai soup ever! Making Thai soups is not extremely complicated, but you just have to remember that you have to cook your food to your exact taste - there's no precise measuring when it comes to cooking Thai food - it's really up to you and your tongue. Be sure to taste quite frequently when you cook this soup! It should be slightly salty, spicy to your taste and quite sour. So here is my mother in law's home cooked recipe for the ultimate Thai tom yum goong. Like I mentioned above, Thai food is all about the way it tastes for yourself. This list of ingredients is just a guide and you should take it and adapt it to your own tastes. If you don't think it's salty enough, add more fish sauce or salt or if it's not sour enough add more lime juice! Thai soup should be eaten with a meal that includes a number of other Thai dishes as well as bowls of rice. Instead of scooping the soup into individual bowls for eaters, the Thai way to eat is to just have a single communal bowl of soup and all eaters dip their spoon into the soup to enjoy it together! 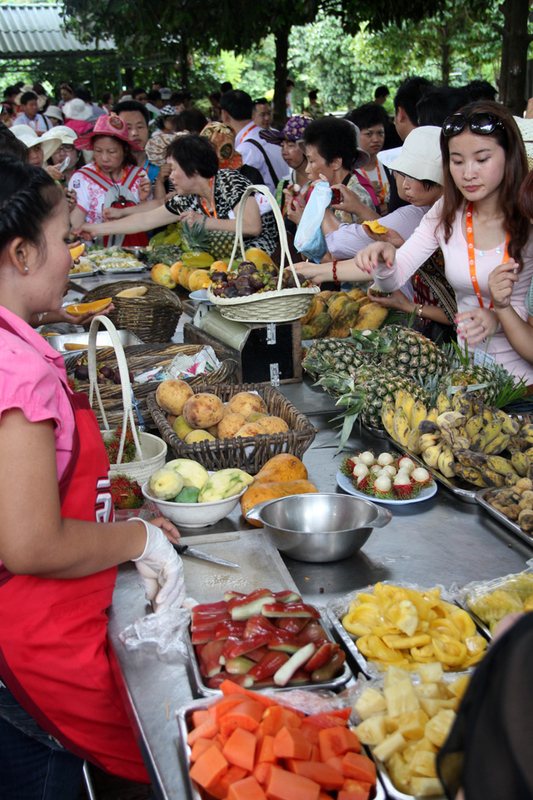 Juicy and Sweet – A Day Trip to Thailand’s Everlasting Fruit Buffet! Bangkok is a city full of delicious cuisine but one of my all time favorite spots for eating is the Wang Lang Market (ตลาดวังหลัง) located adjacent to Siriraj Hospital in central Bangkok. Along with a clothing market, there are a host of cheap sit down restaurants and countless street carts serving some of the tastiest Bangkok street food tours. In this video I start off by taking the boat from Tha Chang pier near Bangkok's famous Grand Palace (and Wat Phra Kaew), which costs just 3 Thai Baht and takes just 2 minutes, across the Chao Phraya River. As soon as you get off the boat, the Wang Lang Market is right there, ready to be explored. The first thing I sample is from a small street cart serving what I think is some of the best deep fried pork (moo tod หมูทอดชาววัง) in Bangkok. It's moist and and extremely flavorful and goes very well with a bag of black sticky rice. After that I sit down at one of the many Isaan food restaurants and ordered som tam Thai kai kem, regular papaya salad (som tam thai), smoked catfish salad, and nam tok made with beef. Wang Lang Market wouldn't be the same without a few sweet treats too. There are many Thai desserts to choose from, but I chose to try one of the most famous Khanom Tungtag (ขนมถังแตก) stalls in all of Bangkok. The dessert is similar to a waffle that is cooked on a griddle and then topped with sweetened shreds of coconut. Taking a Bangkok street food tour to the area of Siriraj Hospital is one of the most rewarding ways to eat delicious Thai cuisine for cheap! How to Eat Like a Food Blogger and Stay Slim ? Visit http://migrationology.com/ for more travel and street food. Beef is not always available in Bangkok, so when I hear about a restaurant serving top notch Thai noodles with beef, I get pretty excited. In this video, I visited a little set of stalls on Udom Suk road in Bangkok, Thailand to slurp down a deliciously beefy bowl of goodness. The noodles along with a few sprigs of morning glory and bean sprouts were blanched in boiling water before the thumb sized chunks of fall apart tender beef were added to the soup. The soup was an oily but massively flavorful combination of beef flavoring. Beef noodles are a wonderful addition to world of Thai noodles! If you'd like to go to this exactly spot, here's the information you'll need. It's closest to Udom Suk BTS station, but the restaurant is still about a 20 minute walk from there. You may want to take a motorbike taxi or jump in the back of a communal vehicle (rot songthaew). There's a ton of amazing Thai food, but in the end for me it all really comes down to southern Thai food. It's more like Malaysian food, flavorful dishes made from fish, scorchingly hot soups and curies and coconut milk it widely represented. In the episode I enjoy one of my favorite flavors in the entire world, a Thai southern soup known as Kaeng Som (แกงส้มใต้). The base of the soup is made with garlic, lots of chillies and fresh turmeric root. Those ingredients are blended and added with water. Kaeng Som can be made with a variety of other ingredients but for this particular version, we made it with slices of barracuda fish and with sweet pineapple. It's also common to be cooked with bamboo shoots, green papaya or young coconut shoots. The flavor is intense, a hot and sour soup that will literally probably burn your throat going down but that will flavor up your mouth like you've never imagined. If you ever get sick and need to clear your nostril, kaeng som is the ultimate treatment! Note: In Bangkok when you order kaeng som (แกงส้ม), it's a red sweet and sour soup - but in the south, this is was kaeng som is, sometimes referred to as kaeng leung in Bangkok. 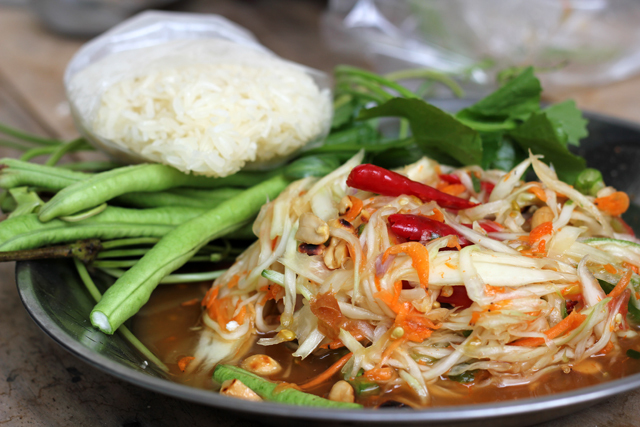 Southern Thai food is a complex cuisine of wonderful and often robust flavors. When you're dining in Thailand, it literally can not get much better! A weekend film project that looks at my favourite food dishes in Ubon Ratchathani, Thailand. Dishes include classic Thai street food to home-made waffles and ice-cream. Go to http://migrationology.com/ for more travel and food! There are all kinds of Thai desserts, but along with sticky rice and durian (or mango) one of my all time favorites is Thai shaved ice known as nam kang sai (น้ำแข็งใส). Everyone makes their nam kang sai a little different but the basic dessert includes a choice of candied fruits and other sweet things mixed with sweet syrup and topped with a dollop of crushed ice. I normally order the mixed shaved ice which in this case included geen noodles, water chestnuts, pieces of jackfruit some sweet potato and a few other candied items. It was then drowned in rich coconut cream and a big pile of coarsely ground ice was placed on the top. While I'm not always a fan of all Thai desserts, this particular nam kang sai was excellent! Get a copy of my "Eating Thai Food Guide" : http://www.eatingthaifood.com/eating-thai-food-guide/ - Thanks for the support! Ziplock bags don't exist in Thailand. Instead, everything, and I mean literally everything consumable is thrown in a plastic bag and tied shut with a rubberband. The vendors selling Thai street food have taken their art of loading plastic bags and tying them as fast as possible. So here's a quick tutorial video that shows you exactly how to tie a plastic bag with a rubberband like a local Thai. The most important thing is that the bag is airtight when you finish, and don't forget to include a nice looking pillow of air at the top of the plastic bag to make it look better! Have you ever tied a plastic bag Thai style? Let me know how it went. Go to http://migrationology.com/ for more travel and street food! Bangkok is a huge city, but the city comes together into a few central hubs, one of them being Victory Monument (อนุสาวรีย์ชัยสมรภูมิ). Victory Monument is one of the transportation centers of Bangkok, a lively roundabout that always flowing with traffic of all kinds and bustling with people. In Thailand, as in much of the world as well, where there are lots of people, there will be lots of street shopping and lots of street food as well. Not only can you catch a Bangkok bus, van, taxi, motorbike taxi or the BTS skytrain, you can walk around the entire circumference of Victory Monument (อนุสาวรีย์ชัยสมรภูมิ) and snack all the way around. In this video first I stop at a stand selling all kinds of dried and salted fruit. Be sure to try the dry grapes, they are intensely sour and salty on the outside making them a real strange and surprising treat. They are small but will definitely wake you up! Street bottles of freshly squeezed bright orange juice are everywhere on the streets of Bangkok and Victory Monument is no different. I stopped at a stall to pick up a bottle of orange juice - and despite it being quite sweet, it was indeed very refreshing! The bottle of orange juice cost a total of 50 Thai Baht. A visit to Victory Monument in Bangkok would be incomplete without a visit to the boat noodle alley, one of the most delicious activities to do in Bangkok. The noodles are served in small bowls, so it's customary to eat a lot of bowls and stack them up on the edge of your table. Eat and eat and eat, and when you're done, the waiter simply counts your bowls and tallies up your bill from how many bowls you ate. Thai boat noodles are extremely delicious, flash blanched rice noodles bathed in thick rich porky broth along with a few sprigs of morning glory, some pieces of meat, and a few pork meat balls. If you're hungry in Bangkok, boat noodles will come to the rescue! If you're looking for what to do in Bangkok, make sure you include a walk and and eating tour of Victory Monument on your itinerary! In Thailand, Is This the Perfect Meal? Thailand, like many other places in the world, is a country that loves to eat ice cream. In fact, there are so many ice cream options that it can be challenging to figure out just what kind of ice cream to eat! From high quality expensive ice cream parlors to cheap street served ice cream from bicycles carts, you'll enjoy eating a frozen sweet treat on a hot day in Bangkok. One of my personal favorite methods of eating ice cream in Bangkok is by grabbing something known as itim khanom pang (ไอติมขนมปัง), which translates to an ice cream in bread, or an ice cream sandwich. And this is not fake, this is the authentic real deal - a few scoop of ice cream pressed between a real bread bun. While coconut ice cream is the most popular and widely available flavor of Thai street ice cream, some vendors also carry chocolate, strawberry and vanilla. First order your bun, then ask for some sweet sticky rice at the bottom, then pile in the frozen ice cream and finally top things off with a sprinkle of toasted peanuts (if available). The bread does an excellent job of catching the ice cream that melts so fast in the hot weather of Bangkok. So next time you visit Thailand or Bangkok, be sure to grab yourself an authentic Thai style ice cream sandwich (ไอติมขนมปัง)! 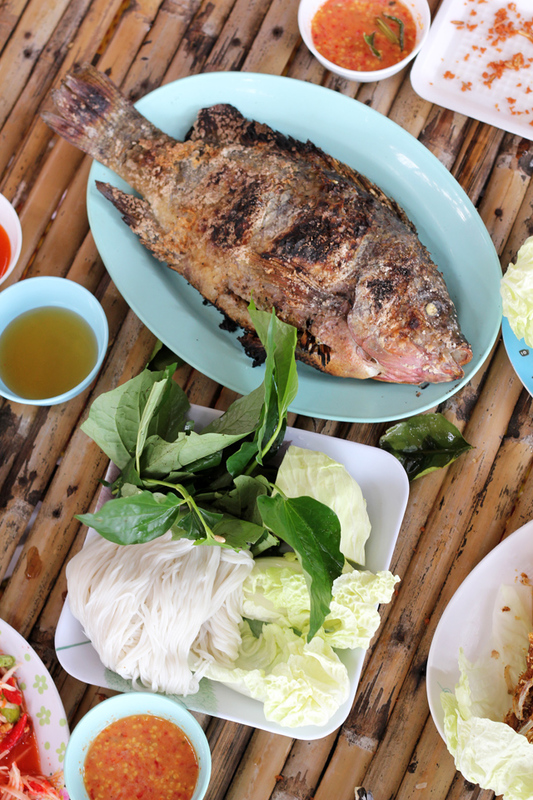 Featuring fresh ingredients and a heavy French influence, Lao food is a delicious fusion of Asian and Western flavors. A Lao local and head chef at one of Luang Prabang's most famous restaurants, Joy learned how to cook growing up in Laos. Follow him as he takes visitors through Luang Prabang's famous markets and then outside of town to learn how to cook some of his restaurant's signature dishes. Warning: this video will make you hungry. Colours, Smells, a mix of them for a new food experience! Shot on float markets, village markets, sea markets on many location. Visit my site http://migrationology.com/ for more delicious food! Click the "link" above! Nasi lemak is more than just the national food of Malaysia, it's a home comforting dish that the entire country is passionate about eating. Love for nasi lemak is nothing short of extreme affection, a purely delicious bonding form of cuisine. But what is nasi lemak? In Malays, it translates exactly to "fatty rice," but in reality the rice is steamed along with coconut milk and pandan leaves so it becomes fragrant and slightly creamy. It's not ordinary rice, it's pumped with extra flavor. Grains of the rice shouldn't be clumpy, but rather loose, not overly wet, but just perfect. After rice is piled onto a plate, a choice of different other heavenly toppings are added to the top and the plate of nasi lemak is ready to be enjoyed. Kuala Lumpur has a lot of food to chose from, and one of the best street restaurants in town is known as RA Nasi Lemak - a home style restaurant that caters to a local crowd searching for comforting cuisine. I showed up at about 9 am to get a taste, and there were a few people in line and many people were eating at the tables provided. Unlike other nasi lemak restaurants where the vendors serves you, at RA you are free to top your fatty rice with whatever you choose using self service. I scooped on some fried morning glory vegetables, some sambal sotong (squid in chili sauce), ikan bilis (peanuts mixed with anchovies), lots of sambal chili sauce and a big chunk of pure heaven chicken rendang (chicken curried in coconut milk). I've had a lot of good Malaysian food meals in my life, but I'm telling you that this plate of nasi lemak was easily one of the most satisfying meals I've ever consumed in my entire life. The chicken rendan was cooked to perfect, stewed in coconut milk and pureed spices that coated each bite in magnificent flavor. The squid in chili was equally delicious, not too chewy and bursting with flavor. Also, the sambal chili sauce, was perfect. It was spicy, not sweet, and went so well with all the other dishes. The combination of the rice and the toppings elevated my mouth into new highs of culinary satisfaction. Next time you're in Kuala Lumpur, be sure to check out RA Nasi Lemak.